A diaphragm wall is a reinforced concrete wall that is made in-situ. The trench is prevented from collapsing during excavation, reinforcing and casting by the use of supporting bentonite slurry. The slurry forms a thick deposit (the cake) on the walls of the trench which balances the inward hydraulic forces and prevents water flow into the trench. A slurry made of polymers can also be used. Model/Type: SG35, SG46, SG60, SG60A. Diaphragm Wall Grab: Brand: JINTAI: MODELS: SG35, SG46, SG60, SG60A. Diaphragm walls provide an economical heavy duty embedded retaining wall and hydrofraise reverse circulation excavation rigs. We also provide diaphragm wall equipment and top head drive drilling system for operations, featuring ease of transport, great mobility and compact structure. HEAVY DUTY REVOLVING TELESCOPIC KIT FOR DIAPHRAGM WALLS. • Square type Kelly Bar of 3 elements for 32m depth. • 180 degree revolving guide frame which revolves by hydraulic motor. • Left & right hydraulic hose reel. GKV Infrastructure is one amongst leading foundation work providers. One of our fine construction services is Diaphragm wall construction service. 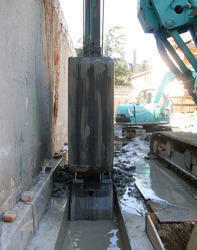 Diaphragm walls, also known as Slurry walls, are an important structure to accelerate certain construction activities. In recent times, need for underground space has increased for various purposes like tunnels, parking, and railway stations, etc. Deep excavations are needed but in congested cities, nearby structure may experience structural problems. Diaphragm walls have a static and / or sealing function and can serve as cut-off walls for dams or excavation pits, as foundations or as enclosures of structures.